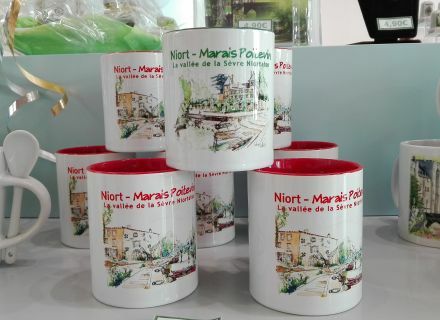 Home / Le blog / Mugs were stamped Niort-swamp Poitevin, it is collector's! 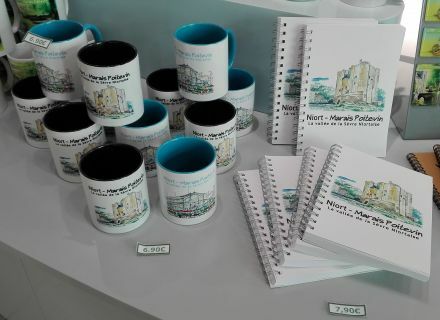 Mugs were stamped Niort-swamp Poitevin, it is collector's! 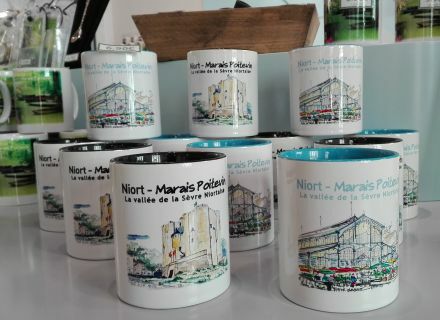 This week, we welcome with great pleasure to the shop of the Tourist office, a private collection specially created for the Tourist office, a range of four mugs personalized just like Niort and like the Swamp from Poitou. Mister André, painter watercolorist, specially drew for us two views of the Swamp from Poitou. We had already had a real crush for the donjon and the Les Halles of Niort which it had crunched with the draftsman's eyes. We asked him to represent two views of Coulon and Arçais by going on the ground. 1. Mister André, we blew me in the ear that you had arrived 14 years ago at Périgné. are you native of our beautiful region? Speak to us about you in a few words. Coming from Savoie, via Lyon, I discovered and appreciated immediately this beautiful western region in 2002: villages and active towns, beautiful protected stones, peaceful countryside. Sometimes missed only me some mountains to spot me by raising eyes, in bike or on foot in the countryside. 2. How came to you this desire to create, to draw, to paint watercolors and in how old are you begun the drawing? I really learnt to draw and to use the watercolor during my studies of architect, in Grenoble, from 18 years only. It was techniques to master for this job, but it fast became a little more, a real pleasure. Thus I drew a lot and painted during these years of studies; I then drew "in dotted line" until 2013. I acquired a pad, a pencil and a gum to begin again by crisping on the spot, towards Saint-Nazaire where I worked, the sea and the boats! And the rediscovery of the sketch does on site, during small moments "in brackets". 3. What are the landscapes, the atmospheres of street, the unusual places or the cities which you crossed and which are the ones who the most marked your spirit? I like installing me very much in the corner of a simple street which photographed would be lacking maybe originality, but which the drawing, the sketch, can make speak about her. An isolated, remarkable building, is more delicate to seize staged "not to appear as a statue or a trophy of devourer. My habit to draw cities makes me discover, whatever their size or their fame, interesting decorations. During the last three years, the places which have me the most delighted by drawing are Central Park in New York, The garden of the School of Fine Arts in Milan, the center of Manchester, but also the stores of which I was crisp beams in Niort, Melle, La Rochelle. 4. What are, according to you, the inescapable places on the territory Niort-swamp Poitevin and the valley of Sèvre Niortaise? Have you new projects of watercolors on these various places? In Niort, I have been already crisp a good many of streets and a good many of interesting buildings (the donjon, the city hall, the Halles, the Passage of Trade, the Pillory …), but I "redraw them with pleasure". I drew little in the Swamp, in particular the ports of Coulon and Arçais, but I am going to dedicate some summer days to complete my pads of observation. 5. I know that you like particularly the Halles of Melle. You moreover made a very alive and realistic representation of the Les Halles of Niort in our most great pleasure. We like very much this representation of our city heart where every day an excitement reigns market days. We moreover chose this magnificent postcard in our selection in the sale to the shop of the Tourist office Niort-swamp Poitevin. What inspires you this building? The building is impressive, representative of the "modern" and elegant architecture, in cast iron of the 19th century. The plentiful internal light, without being believed, because of the meshing of the fine structure strengthens the animation of the activity of stalls: the sunlight is as cut and multiple. It is a really alive place the function of which crosses the time and on Saturdays mornings, it is really the heart beating of Niort. In my imagination, the city gets organized even today completely around these Les Halles. 6. You represented big niortais buildings as the donjon and the city hall, like a architect. What is your secret so that these monuments are also true as natural? What advice would you give to enthusiasts of drawing who do not dare to turn the corner to take diligent courses so that they can begin simply their desire to create? What really facilitates me the work, it is to feel at ease with the representation in volume, the representation in prospect, and contrary to an idea which I often meet, it learns and it is not very complicated, no more than the knitting or the mechanics! My advice: try, you risk nothing! Or rather if, to waste some sheets, but keep well all. Your visible progress will encourage you to continue and go through books or blogs of sketch: I learn a lot by looking other "urban sketchers". 7. Our visitors appreciate your representation of the dragon niortais a lot. What inspires you this dragon? Do we sometimes ask you to explain the watercolors which you immortalize on your pad with sketch? Nice this dragon! When we arrive to Niort, her statue "life-size" impresses and amuses. It is a historic reference and a decoration which transports me in a universe of children's stories. 8. You like the places which swarm and nevertheless you agreed to represent us the Swamp from Poitou which we like particularly. We are very proud of both pictures whom you proposed us on Arçais and Coulon. Place of peace of mind and tranquillity in the off season and place of meeting and animation the summer, do you think return to the swamp to draw? How do you see the swamp with your artist's eyes? In the swamp, the most surprising and most interesting in my experience of drawing, it is of what I have not yet managed to express as I feel it: the charm of the luxuriant green landscapes, the enigmatic faces of tadpoles and the power of poetic evocation of the cows which graze on their luxuriant "islands". 9. This year, we prepared a beautiful surprise to our customers. These watercolors will not be anymore only on postcards. 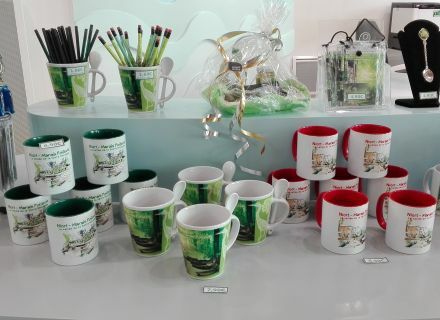 We invite them to take a seat on an attractive collection of mugs that it will like to offer itself or to offer to his close friends on the occasion of a particular event. I shall end this interview with only a question which means a lot to me. I know that you liven up workshops by explaining your method of work and to the decoration. Gentleman "Croctoo" or rather crunches everything, you would agree to come during the season to draw in our Tourist office to highlight, through a watercolor, our job and our values. The Tourist office, the meeting place, of exchanges and information: we would be delighted that this place swarms with world one day of July and that you immortalize our activity. Thank you for the invitation and with pleasure, in this former beautiful space and always alive, again "modern, as I like!